Close up of the bedroom window. We have been decorating our house with Christmas lights ever since we moved in to Clarafield Crescent mid 2006. Back then we only had a few strings of multi coloured incandescent lights and some white incandescent icicles for a very simple static display. 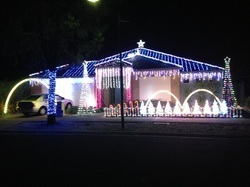 But with the post-Christmas sales each year and a growing addiction to lighting up the house and spreading the Christmas spirit, we managed to build a fairly substantial static display. LED's soon became the light of choice, being much brighter and more efficient to run. By 2011, we had close to 10,000 lights on display. During the 2011 Christmas season, I stumbled upon the AusChristmasLighting forum. This changed everything and my desire to have complete control over my entire display could be realised. With the help of everyone at ACL, I soon had a 48 channel controller and could now make blinky flashy in time with the music. Follow the progress of our show from design to "Switch ON"